Mairéad Byrne emigrated from Ireland to the United States in 1994, for poetry. On the plane over, she read about the Internet for the first time. Diversity of poetic cultures and connectivity have defined her life ever since. She earned an MA in American Poetry (1996) and a PhD in Theory & Cultural Studies (2001) from Purdue University—home of the first Computer Science Department in the US. Her poetry collections include You Have to Laugh: New & Selected Poems (Barrow Street 2013), The Best of (What’s Left of) Heaven (Publishing Genius 2010), Talk Poetry(Miami University Press 2007), SOS Poetry (/ubu Editions 2007) and Nelson & The Huruburu Bird (Wild Honey 2003). Collaborations with visual artists include Jennifer’s Family, photographs by Louisa Marie Summer (Schilt Publishing 2012), Michael Mulcahy (Gandon Editions 1995), Eithne Jordan (Gandon Editions 1994), and Joyce—A Clew, with Henry J. Sharpe (Bluett & Co., 1982). She has taught at Purdue University, Ithaca College, the University of Mississippi and Marshall County Correctional Facility in Holly Springs. Since coming to RISD in 2002, she has designed and taught courses in Material Poetics, Sound Poetry, Visual Poetry, Contemporary Poetry, Metaphor, the Irish Comic Tradition, Writing as Art + Design and poetry workshops at three levels. 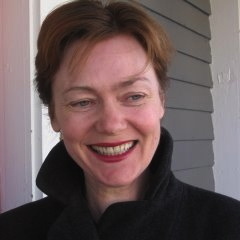 Mairéad will be Chief Critic for the European Honors Program in Rome, July-December 2013.